This website hosts significantly higher number of underwater images (see AQUAGRAPHS) compared to land or microscopic images, so many photographers who have no experience taking pictures underwater may interest on the techniques and equipment which are described briefly in the following paragraphs in order to give reader a general idea of how these things are done. Underwater photography is potentially the most difficult of photographic disciplines, as most techniques, which work well above the sea surface usually, fail miserably underwater. In addition you are required to work in a totally alien environment, having to keep your attention on monitoring your life support system, dealing with buoyancy and prevailing sea conditions, all the while employing the skills of an image hunter and an artist. 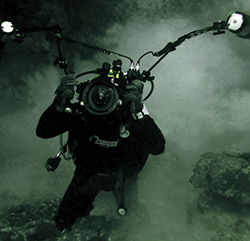 The photographs in this website have been taken by six different underwater camera systems (see Figure 1). During 1996-2001, I had taken as many photographs as possible with my first underwater camera using Kodak and Fuji positive slide films with a speed of ISO 50 and 100. Most readers might be surprised after learning that some of the images in this website were obtained using a beginner-level amphibious camera system (a Sea and Sea MX-10 with YS-40a flash). Although focusing on a close subject is somewhat problematic using the macro gear on a MX-10, normal to wide angle snapshots seem indifferent from the ones taken by more sophisticated systems. The main disadvantage of using such a compact and simple system is that one must use them in automatic mode. However, many beginners will benefit if they spend some time trying different apertures and light conditions. Figure 1. My underwater camera and housing systems since 1996. When certain subjects were almost impossible to pose with this amphibious camera, I upgraded to a more complicated one with a reasonable amount of investment. This was a housed SLR camera with a powerful flash. I started with a Nikon F-80 analog camera housed in a Sea and Sea NX-80 system, which was supported by a Sea and Sea YS-120 Duo TTL flash, and an automatic focus light. As before, I kept using the same kind of positive films. Unlike compact, point-and-shoot cameras, housed SLR systems are limited to certain lenses and do not have the advantage of interchangeable lens capability underwater. For this reason, all dives had to be pre-planned in terms of lens and subject selection. I remember some dives dedicated to photographing certain sizes of nudibranches. The YS 120 Duo flash has been my primary and generally the only flash in my dives until I owned secondary flashes. While it provides sufficient light in long distance shots such as catching the images of schools of fish, wrecks and group pictures, its TTL capability works particularly well in illuminating miniature objects. Later, I acquired a slave TTL flash, the Sea and Sea YS-30 TTL Duo. Especially in night dives, the YS-30 does well to eliminate sharp shadows. Nevertheless, I prefer to use a single flash, as I feel more creative when using a single light beam on the subject, unless I want to take a picture for documentary purposes. 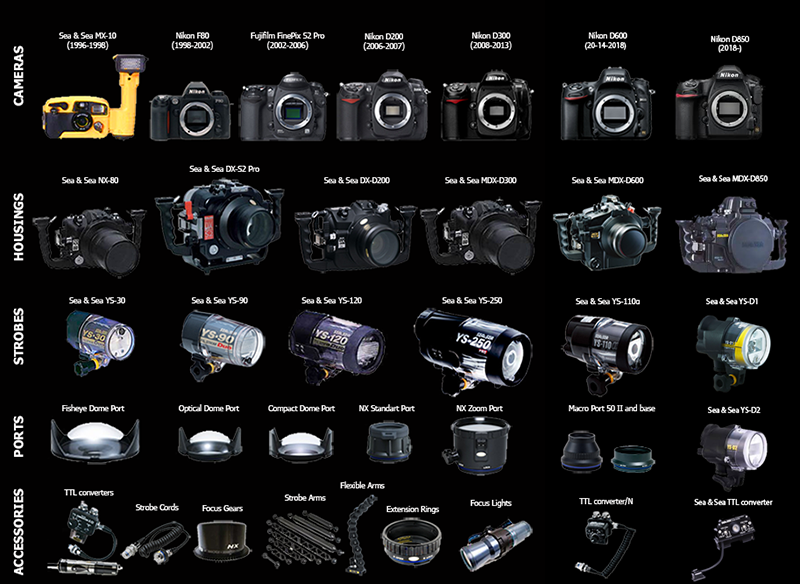 After I shot around eight thousand pictures with my NX-80 system, digital underwater cameras appeared on the market with substantially more powerful solutions. As I was happy with my Nikon F-80 body, I found myself purchasing a 12-megapixel Fujifilm FinePix S2 Pro SLR camera originally designed from the Nikon F-80 body. In a couple of months, Sea and Sea presented a DX-S2 housing dedicated to the Fujifilm S2 Pro camera. Up until 2006, this has been my exclusive underwater camera system and I appreciate its problem-free TTL compatibility, which does not require any external TTL converter. The aperture-controllable Sea and Sea YS-90 TTL Duo flash was added afterwards. Together with the YS-120 Duo, these flash units provide more than enough light even in the darkest conditions. When Nikon released D200 SLR in 2006, I thought, I need to return back to Nikon and purchased a Nikon D200 with a Sea and Sea DX-D200 housing. Unfortunately, Sea and Sea brand external TTL converter (II and III) did not work properly. Manual light adjustment was fine in wide-angle photography, but since I admire taking macro images, using Sea and Sea DX-D200 system in macro photography was a real disappointment, so it did not take too long saying goodbye to this system. After a couple of months diving with my faithful Fuji S2 Pro system, even thinking to switch to a Canon system, I suddenly found myself purchasing a Nikon D300 camera especially fascinated with the successful results in high ISO values. Few months later Sea and Sea released a new generation housing for D300, which is called MDX-D300. I have been using this system since May 2008 and fascinated with its new color management machinery. Simultaneously, I owned a Sea and Sea YS-250 strobe. I think it’s more than a photography flash but an ultimate uw lighting system. I doubt only a few uw photographer really needs it. 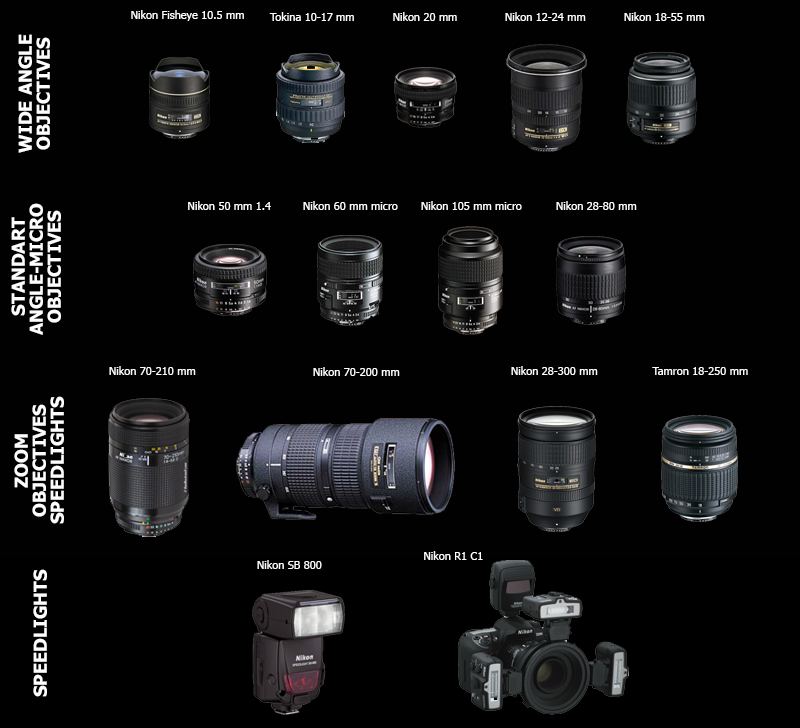 If you have a digital camera, you inevitably wonder the capabilities and limitations of the famous micro lenses (60 and 105 mm micros) as well as more expensive but outstanding lenses, such as the 12-24 mm or the 10.5 mm fisheye. I really enjoy using or even gazing at the underwater environment behind a fisheye lens. Figure 2. Autofocus lenses and speedlights I use underwater and at land. The microscope is one of the most versatile instruments available to science since 16th century. My professional area of interest deals very much with all sorts of microscopy techniques by which occasionally magnificent images emerges during our observations. So, the main idea of adding some of our microscopic images to this web site (see MICROGRAPHS) was to share miniature structures with general watchers. Undoubtedly, neither any scientific classification nor any systematic presentation is concerned. Obviously, this site does not intend any microscopy teaching or a gallery of the microscopic images of cells and tissues. It is no more than a taste of a bit of laboratory art and the small world of nature. A microscope is an instrument designed to make fine details visible. Therefore, the microscope must accomplish three tasks; produce a magnified image of the specimen (magnification), separate the details in the image (resolution) and render the details visible to the eye, camera, or other imaging device (contrast). Teaching microscopy has been one of my primary duties since I started studying cells and tissues. While I was learning the basics, I also had to share what I have learned with my colleagues and then with my graduate students. Over the last 10 years, I found myself several times being the coordinator and the lecturer of Basic and Advanced Light Microscopy Courses, which in fact gave me great pleasure. Similar to my story regarding to the beginning to underwater photography, I was lucky enough to start microscopy almost from the beginning. When I started as a PhD student in Ankara University more than 20 years ago, a 30-year old Zeiss optical microscope was the only one in our department. I must admit that I learned the basic microscopy as well as the problem solving by using (!) this microscope. Thanks to the funding bodies who gave us to set up modern laboratory facilities during the following years for doing good science and thus using many sophisticated microscopy techniques. We purchased a modern photomicroscope with an analog camera, then a confocal laser system which was a real breakthrough in my lab. Live cell imaging systems followed the fully automated all-in-one digital microscopes in recent years. Now, there are a quite number of microscopic systems in the lab serving to the graduate and postgraduate studies. Please, refer to the websites and books below to take a detailed information on microscopy and related techniques. Fundamentals of Light Microscopy and Electronic Imaging. Douglas B. Murphy, Wiley-Liss, 1st. edition, 2001. Basic Methods in Microscopy: Protocols and Concepts from Cells, a Laboratory Manual. David L. Spector, Robert D. Goldman, Cold Spring Harbor Laboratory Press; 1 edition, 2005. Light and Electron Microscopy. Elizabeth M. Slayter, Henry S. Slayter, Cambridge University Press, 1st. edition, 1992. Introduction to Light Microscopy (Microscopy Handbooks). H. Bradbury, Garland Science, 1st. edition, 1998. Dictionary of Microscopy. Julian P. Heath, Wiley, 1st. edition, 2005. Understanding the Light Microscope: A Computer-Aided Introduction. D.J. Goldstein, Academic Press, 1st. edition, 1999. Science of Microscopy. Peter W. Hawkes, John C.H. Spence, Springer, 1st. edition, 2006. 2nd. Edition, 2008. Optical Imaging Techniques in Cell Biology. Guy C. Cox, CRC, 1st. edition, 2006. Practical Methods in Microscopy. Charles H. Clark, Merchant Books; Ill edition, 2007.